If you don’t have liquid watercolour paint, you can definitely make a larger batch of salt dough and paint your monster pets! 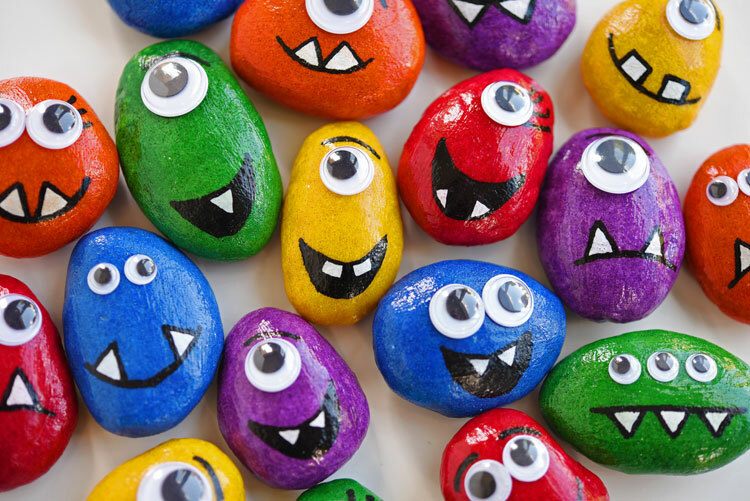 Or you can even make rock monsters from actual rocks – my kids LOVE bringing home rocks! 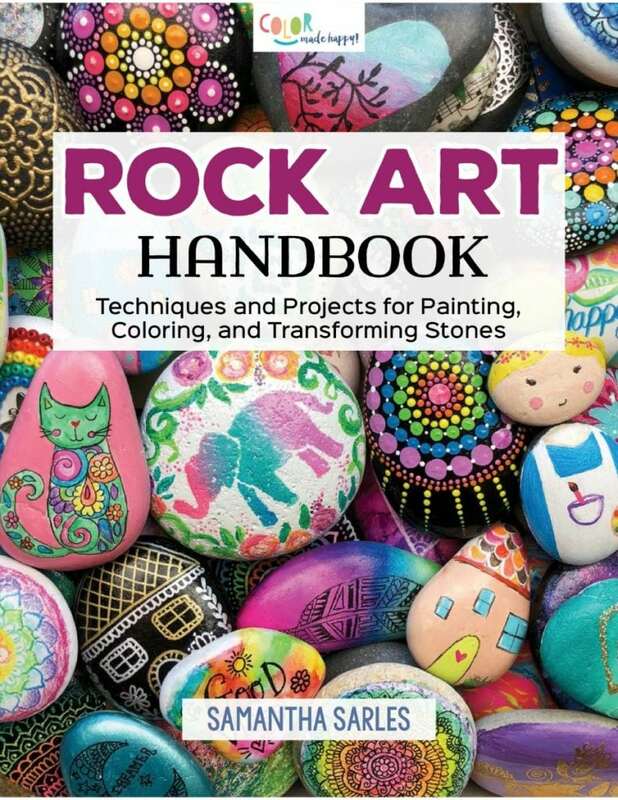 If you decide to paint rocks, check out the Rock Art Handbook by Samantha Sarles at Color Made Happy. This book is my go-to resource when it comes to painting rocks! 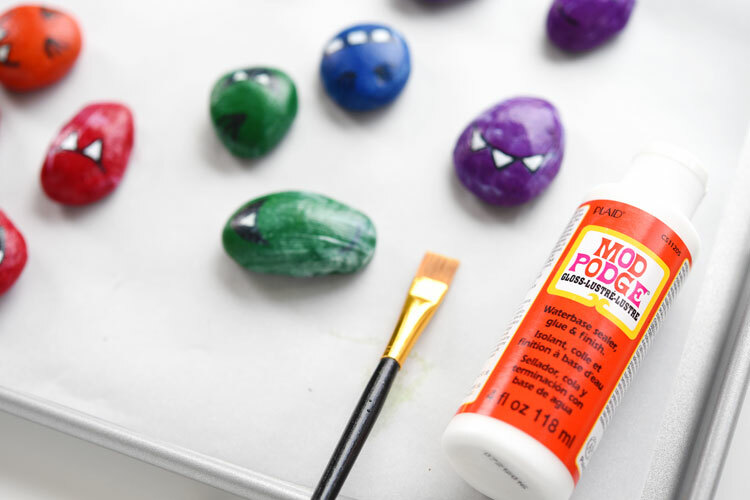 It’s a beautiful book, with tons of rock painting ideas and it outlines exactly what supplies you need in order to paint awesome looking rocks! These salt dough monster pets were inspired by the adorable painted rock monsters made at a blog that doesn’t appear to exist anymore. But you can check out the pin here. 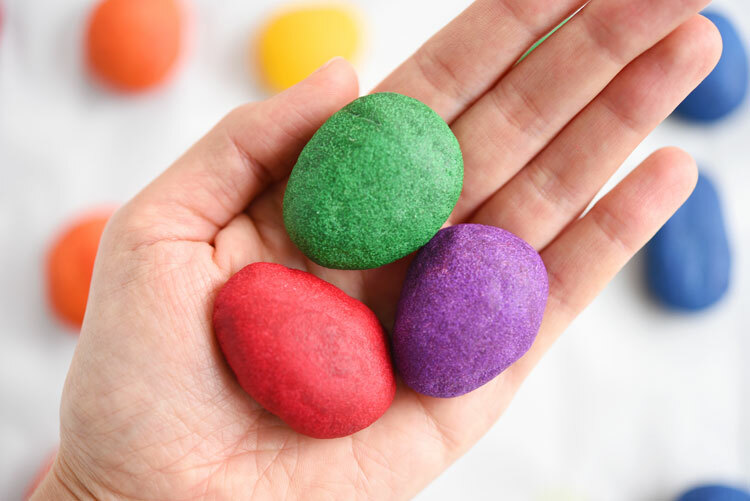 My favourite part about this salt dough recipe is that you can make it in a small batch – which is awesome when you want to make a bunch of different colours! I skipped using water all together and used liquid watercolour paint to make the salt dough. 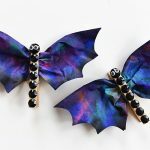 They didn’t have it at my local craft store, but you can find it on Amazon here. I first tried making these using food colouring, but the colours were just blah. But with the liquid watercolour paint, the colours are super bright, even after the dough dries! 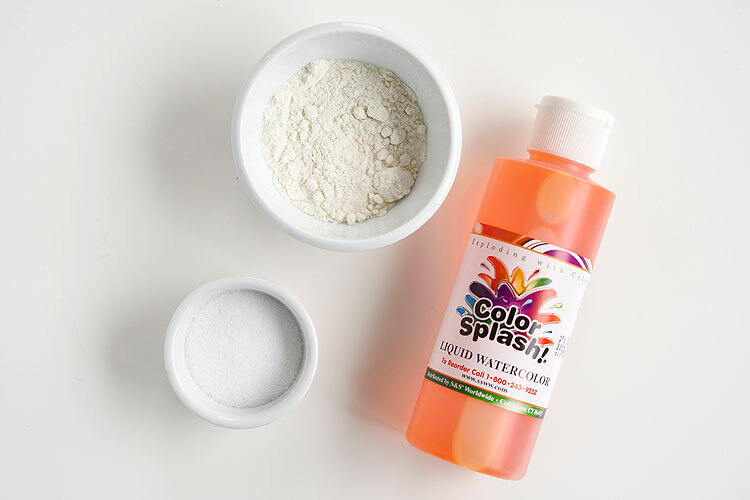 In a small bowl, mix together 2 Tablespoons flour, 1 Tablespoon salt, and 1 Tablespoon liquid watercolour paint (the printable recipe is at the bottom of this post). 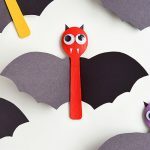 This small batch recipe is enough to make 3 monster shapes. Feel free to double or triple the recipe if you’d like to make more monsters than that. 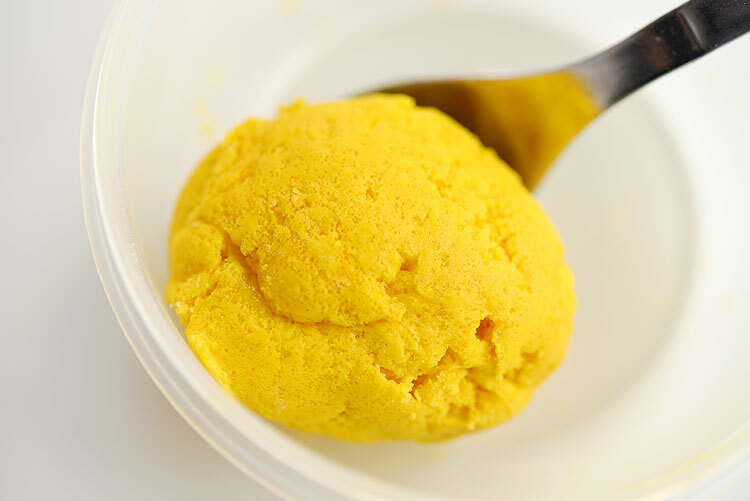 The dough will start off looking dry and crumbly, but as you stir it, it will become a soft, dough-like ball. Repeat the process for all of the different colours. The only colour that needs to be different is purple – 1 Tablespoon of purple watercolour makes it really dark, so fill a Tablespoon about 1/4 full with purple watercolour paint (maybe even less), then fill the rest of the Tablespoon with water. 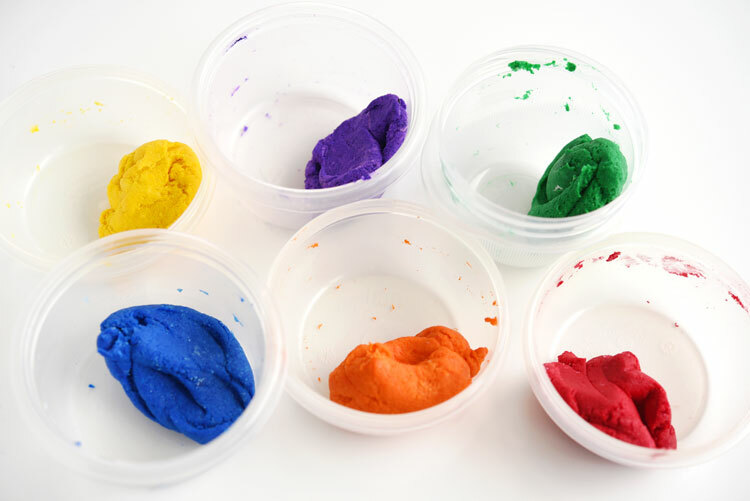 If you’re making a bunch of different colours, cover your small bowls with a wet paper towel as you work so that the dough inside doesn’t dry out. 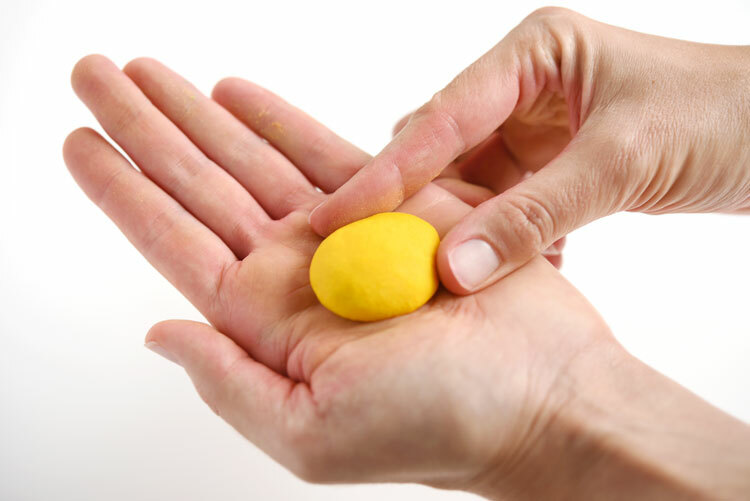 Roll the dough into balls, then flatten them slightly into rock shapes. Make sure you flatten them a bit because the thicker your shapes are, the longer they’ll take to dry out in the oven. 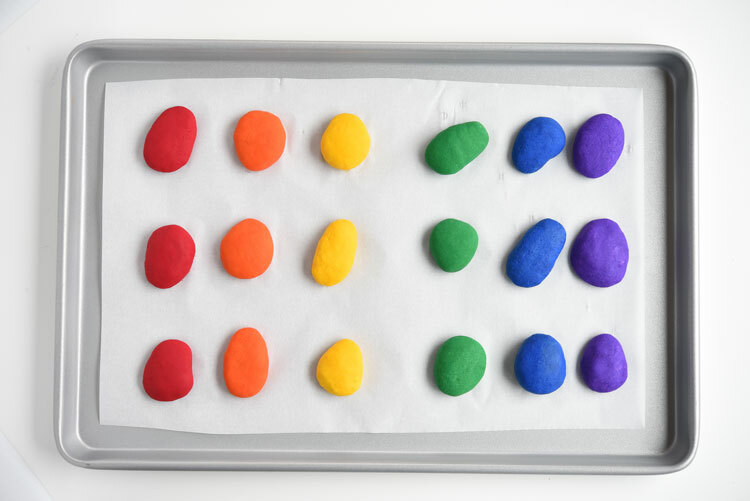 Set the shapes on a parchment lined baking pan. Bake them in the oven at 225F for 4 to 5 hours, making sure you flip them after about 2 hours. The thicker they are, the longer they’ll need to bake to get them fully dried out. 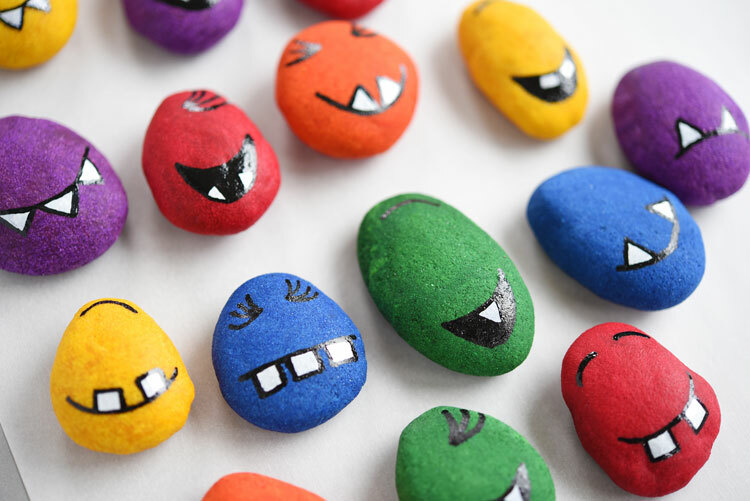 When they come out of the oven and they’re all dried out (photo below), they look just like rocks, except way they’re way lighter and fully coloured! 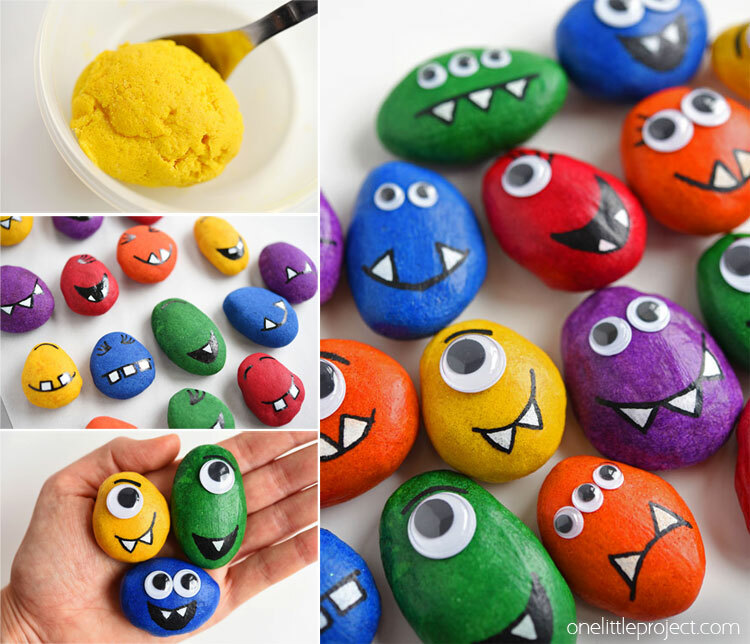 To make the salt dough shapes into monsters, start by drawing their faces onto the salt dough shapes with a pencil. 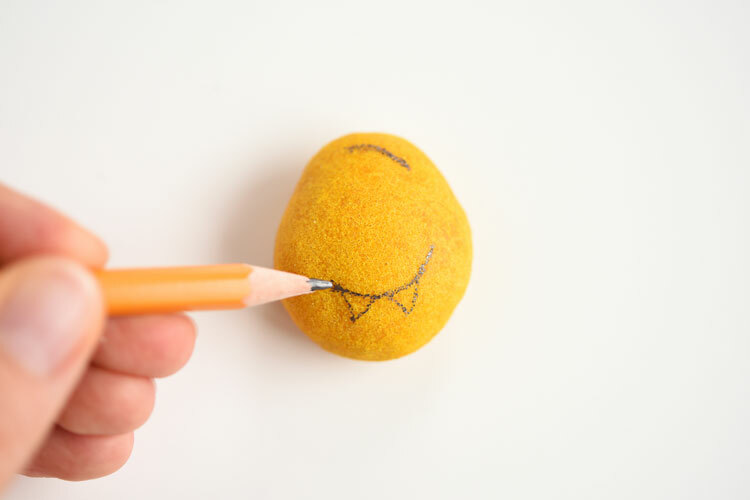 Don’t worry about making mistakes – as long as your pencil isn’t crazy sharp, you should be able to erase the marks from the salt dough shapes. Start by painting the white parts of the teeth first. I used a white paint pen, but you could also use white paint with a small paint brush. Once the white paint is dry, paint the eyebrows, mouth and draw the black lines around the teeth. Again, I used a fine black paint pen, but you could also use black paint with a small paint brush. You can even draw on the salt dough with a Sharpie! (But the colours won’t be as bold as if you use paint). 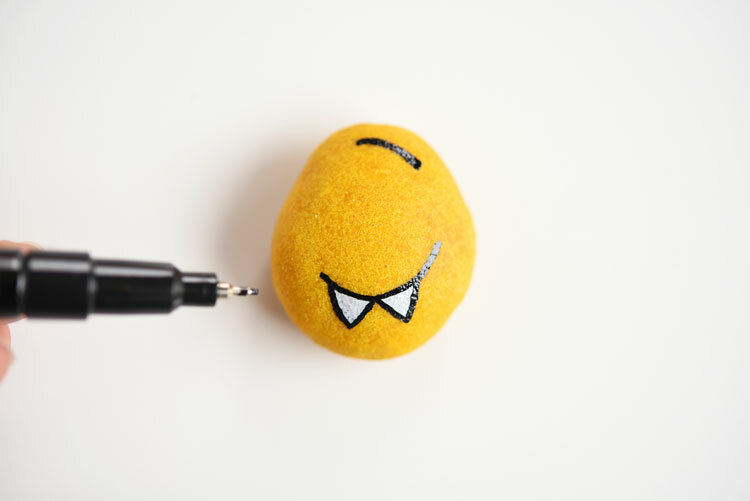 Draw all sorts of faces onto your different monster pets! 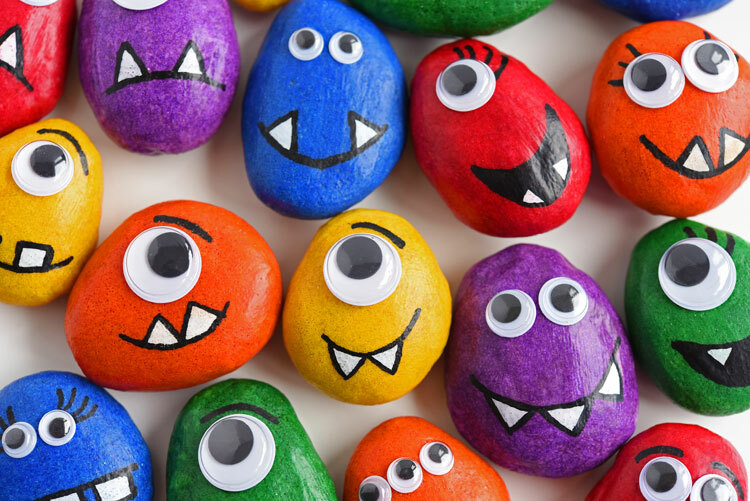 Smiles, pointy teeth, rectangular teeth, eyebrows, eyelashes – whatever you like! 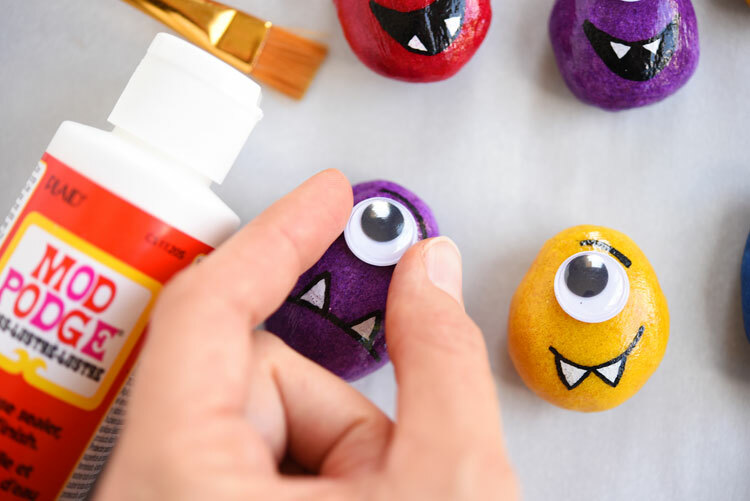 Paint the back of the googly eyes with a bit of Mod Podge and glue them in place on the monster pets. If you want, you can easily turn these guys into fridge magnets! 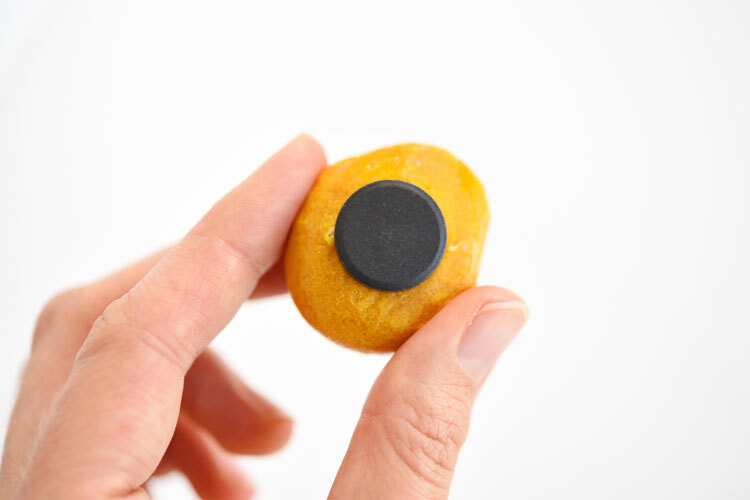 Just glue a magnet to the back! Here are the monster pets with the gloss Mod Podge finish. Wow. That’s just too shiny for my liking!! So I added another layer of Matte Finish Mod Podge to bring down the shine. I love all the bright colours and fun faces! And since they are made from salt dough, they’re really light weight, so you don’t have to worry about the kids dropping them and scratching the furniture or floor. 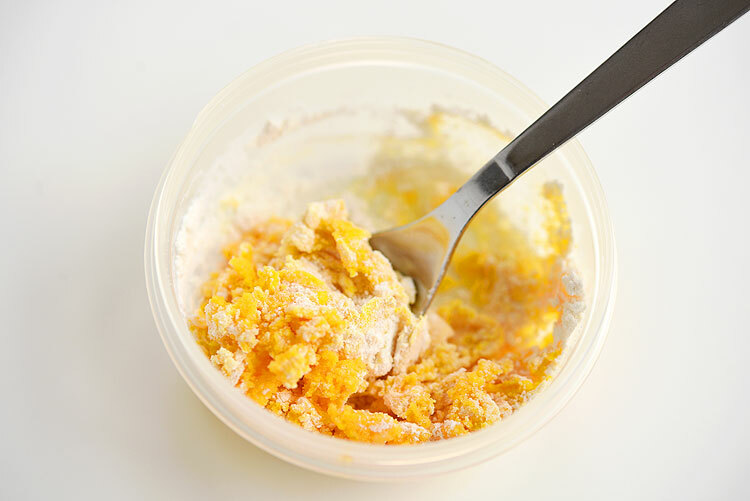 In a small bowl, mix the salt dough ingredients together until they make a dough-like ball. If the dough is too dry, add a few drops of water until it softens up. Repeat for different colours. Split the dough into 3 equal pieces, and roll them into your monster shapes (the shape of rocks works best. Don't make them too thick or they'll take forever to dry out in the oven). Place the monster shapes on a parchment lined baking sheet. Bake the monster shapes at 225F for 3 to 5 hours. Flip the shapes over after about 2 hours and continue baking until they are completely dried out. 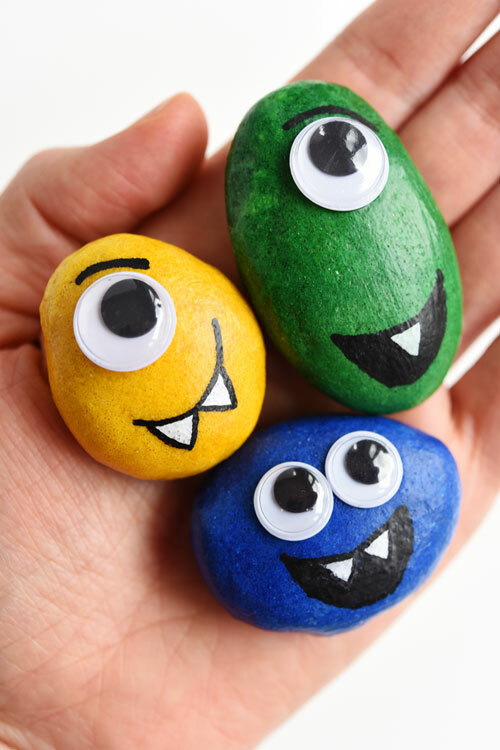 Once cooled, draw monster faces on the salt dough shapes with a pencil. Paint over the pencil lines with white and black paint. 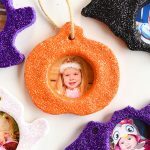 Optional - Seal the salt dough shapes with Matte Finish Mod Podge. Glue different sizes of googly eyes onto your monster pets. I used Mod Podge to glue the eyes onto the sealed salt dough shapes. -Each batch of this salt dough makes enough for 3 monster pets. Feel free to double or triple this recipe if you want to make more. -If the dough dries out a little while you work, cover the bowl with a wet paper towel for 15 minutes and it will soften up. 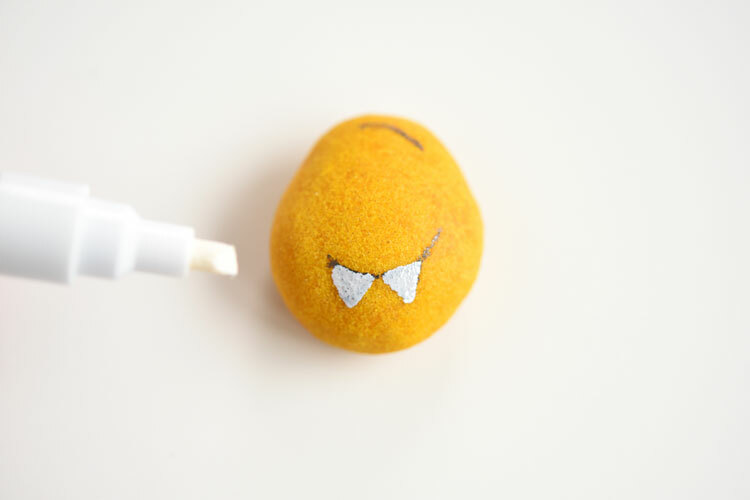 These salt dough monster pets are SO CUTE and really simple to make! You don’t even need to paint them! 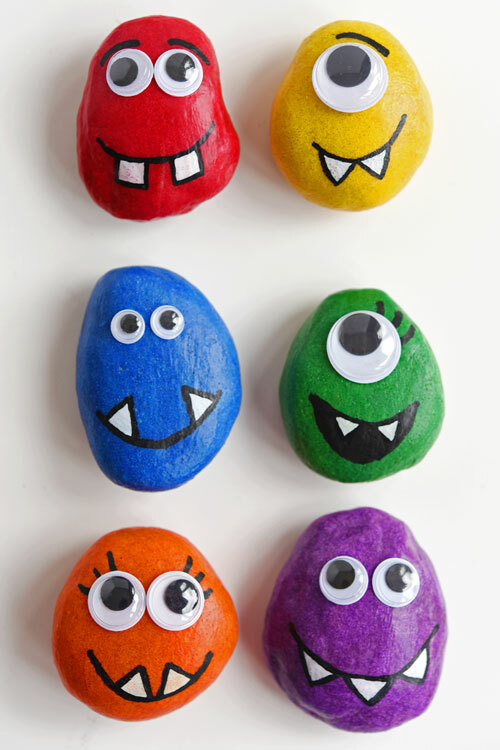 This is such a fun craft to make with the kids and a great alternative to painted rock monsters! 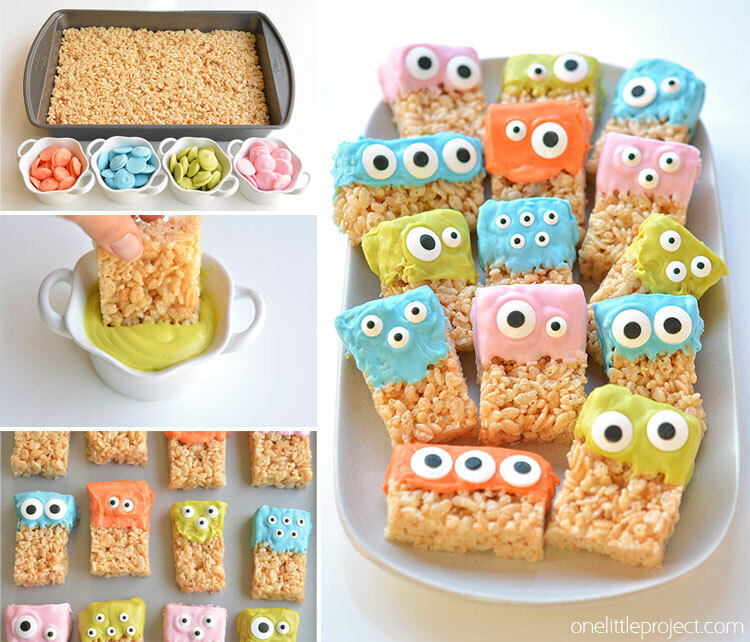 If you’re looking for more fun monster themed ideas, check out our post for making Rice Krispie Treat Monsters. 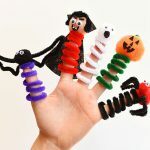 These are so simple to make and so much fun to eat! 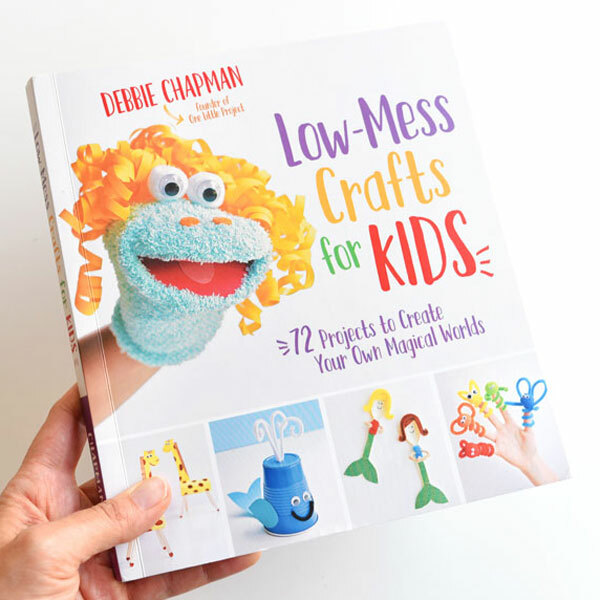 Don’t forget to check out our new book Low-Mess Crafts for Kids for 72 fun and simple craft ideas for kids! It makes a great gift!